My entire family takes a fish oil supplement every day, including our three children. We began taking Omega-3 supplements several years ago on the recommendation of my daughter’s pulmonary specialist as he indicated it can help to calm the inflammation associated with her severe asthma. It is therefore extremely important to me that we are using the highest quality supplement available. Ocean Blue has an ultra-high potency super concentrated fish oil supplement that meets the daily requirements in one tiny pill! What sets Ocean Blue apart from other brands is that it addresses the need to include sufficient EPA and DHA. It is 88% pure which is significantly more purified than the comparable 30 percent or less of other leading fish oil and krill oil formulas. 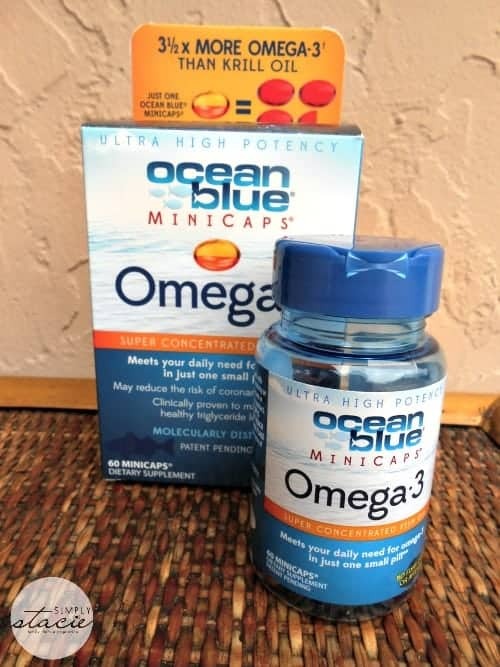 In fact, Ocean Blue Minicaps® have 350mg of omega-3 per serving! What immediately got my attention while initially researching this product is that it is molecularly distilled and it is purified to remove contaminants, has a concentrated dose in one tiny, easy to swallow pill with no detectable odor as it includes vanilla. The first important thing that I made sure to check is that Blue Ocean Omega-3 Minicaps® are mercury free which is a requirement for me in any supplement that I give to my family. Having no odor or fishy aftertaste is extremely important to me too because it means that there is less chance that the supplement has gone rancid or undergone oxidation. I am pleased with our experience so far using Ocean Blue over the past 30 days. You are invited to visit Ocean Blue to read the latest research on what you need to know about Omega-3 supplementation. There are three primary products available from Ocean Blue including the Ocean Blue Minicaps®, Omega-3+D3 and Omega Power. You can purchase the product that is best suited for your needs and shipping is free! It is also available at retailers including Walgreens, CVS and select Rite Aid locations. I like the omega power. I learned I can purchase their products at Walgreens and Rite Aid, two fave places I shop. I like the Omega Power 60 count! I learned that DHA, EPA and ALA (docosahexanoic acid, eicosapentaenoic acid and alpha-linolenic acid) are not made in the body so we need to get them from the foods we eat. i learned that these products are carried at cvs and walgreens which I have right down the street! Ocean Blue® products are made from a highly-refined, ultra-pure pharmaceutical grade Omega-3 fatty acid that is produced exclusively for use in their products. The result is that Ocean Blue® products contain the highest amount of EPA (eicosapentaenoic acid) and DHA (docosahexaenoic acid) Omega-3 fatty acids available per capsule. In addition, Ocean Blue products contain no saturated fats. I learned that Studies show strong evidence that Omega-3 fatty acids go beyond heart health alone; they also help with depression. That it has 3x more power than krill oil…very powerful stuff! Need to try it! I learned that Omega-3 fatty acids are produced in the leaves of green plants and algae. Shellfish eat these plants which makes high concentrations of Omega-3 in their fat. I learned that I can save 10% using auto-ship. Thanks for the giveaway! Omega-3 fatty acid capsules should be consumed in conjunction with a meal for the best absorption. Omega-3s are made in green plants and algae, then eaten by cold-water fish that are used for Ocean Blue supplements! I learned Ocean Blue molecularly distills their products up to 26 times, resulting in a product that has virtually no smell or taste. I love knowing they also use vanilla for flavoring and to eliminate any fishy smell or burps. Fish burps are disgusting!! I like that they 4 four different Omega 3 capsules. I found out they retail in Walgreens and riteaid. I like the omegapower 60 count i need these. I like that they have up to 3 – 3.5 times more concentrated EPA and DHA than regular fish or krill oil. I learned that, unlike most similar products which use fish oil typically made from the by-products of fish processed for food and other uses, Ocean Blue® products are made from a highly-refined, ultra-pure pharmaceutical grade Omega-3 fatty acid that is produced exclusively for use in their products. Thanks for the giveaway. Email subscribe with vixandI at gmail [dot com].